Very interesting. Another parallel (I'll look for a source later) involved the "Beautiful Gate", apparently the gate leading to the innermost court of Herod's temple. The Samaritan community took the two immense bronze leaves of the gate and installed them at a synagogue in Neapolis/Nablus. From there, they were later taken by the Turks to Constantinople, where they presumably are still, though unrecognized. It may be that architectural elements were simply up for grabs in the several centuries of the ruins of the temple. Probably in the mid-fifth century, the temenos was reconstructed and an octagonal Church of Mary Theotokos was built on the site of the Temple's Holy of Holies, where, according to Byzantine tradition, the Virgin Mary was raised as a child (also reflected in the Protevangelium Jacobi). A similar octagonal church was erected over the ruined Samaritan Temple on Mt Gerizim, and others elsewhere (Capernaum, the Kathisma, Bethlehem), apparently the common contemporary form for marking a commemorative shrine at that period when Eudocia happened to be in the area. 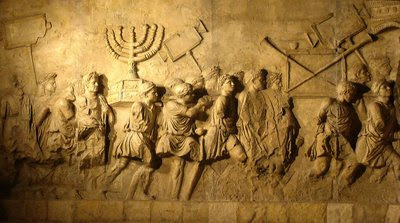 Yes, the Menorah, Table, and the Ziz (the high priest's golden headplate) apparently made it from the Temple of Peace in Rome and eventually all the way back to Palestine, actually. They're lost to history after the Persian invasion, though some suggest they were retrieved by Heraclius along with other purloined treasures, and also returned to Jerusalem. Various monasteries and ruined churches have been suggested as their hiding place. It's hard to say what the cherubim of the gate were, though. 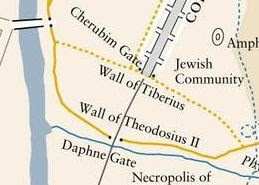 All the Jewish sources proclaim the second temple as aniconic. If they were in Tiberius' gate, though, I'd guess that he had them put there, long before the Temple was destroyed. The tale(s) likely just sprang up due to the proximity of the Jewish quarter. Maybe the were winged Victories or something along that line. Conceivably, they may have been taken from Hadrian's Capitolium, built on the ruins of the Jewish Temple after 135. Once it was demolished (to make way for the octagonal memorial church), perhaps some bronze elements were sent up north. It's all guesswork now, of course. I'm extremely dubious about these bronze cherubim coming from the Jewish context, though. It just doesn't make sense. I have yet to find/recall the reference to the bronze Nicanor gates' transference from Jerusalem to Nablus to Istanbul, however. I'll keep looking! i found an ancient limestone artifact that has 12 cherubs engraved on the outside of it. Anyone interested in helping me figure out this peice of pottery? It is the size of a basketball. Mother nature has really worn her down, I have photos of it.